Brisket Sandwiches with Coleslaw are the king of all sandwiches! 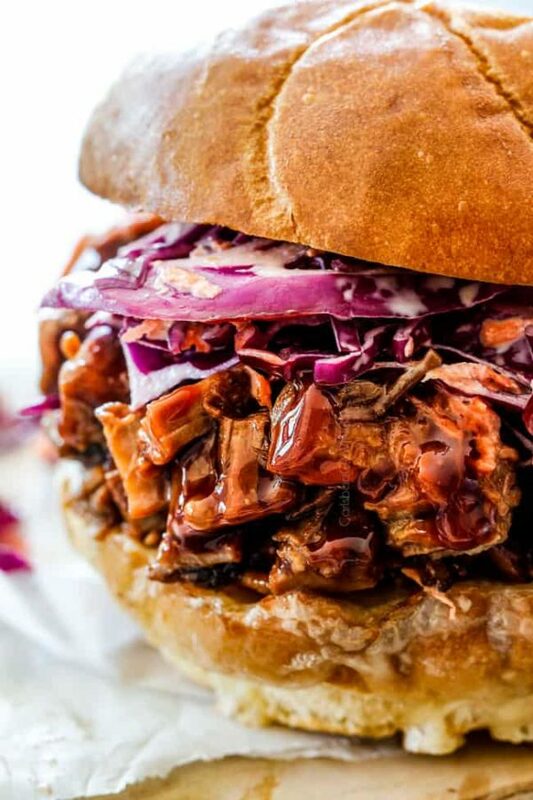 Brisket Sandwiches with juicy, flavor exploding, melt in your mouth barbecue brisket piled on cheesy toasted buns with crunchy, light coleslaw – drool – will be your go-to company meal! They’re super easy to make in the slow cooker, completely customizable, make ahead friendly and the brisket reheats beautifully! With Father’s Day around the corner and potlucks galore, it’s time for easy Beef Brisket Sandwiches! These luxuriously rich, hearty Brisket Sandwiches are summer comfort food at its most drool worthy. They’re the ultimate stress free company dinner because the brisket can be made days in advance then reheated for easy entertaining. Add a side of Brown Sugar Bacon Baked Beans, Million Dollar Mac and Cheese and Award Winning Cornbread, Perfect Fruit Salad and Grilled Corn on the Cob and you have the best summer barbecue plate in town. But even without the extra sides, this brisket is show-stopping fabulous. And don’t worry, even if you’ve never made brisket before, you will find this recipe super EASY without any fancy smoker equipment, but with restaurant-worthy results. It’s rubbed in a tantalizing spice rub of paprika, brown sugar, chili powder, chipotle powder, onion powder, garlic powder, dried thyme, salt and pepper. The rub is not too spicy, not too sweet, but just plain flavorful. It is oven seared which seals in the spices/juices, renders some of the fat and adds a depth and complexity of flavor that can’t be achieved any other way. It is slathered in the “BEST Barbecue Sauce” according to readers that I also use in my Slow Cooker Barbecue Ribs. Readers claim they will never use another barbecue sauce again! It’s slow cooked all day to achieve exceptionally tender, melt-in-your-mouth juicness. Now all that’s left to make it your personal BEST Brisket Sandwich is to choose your favorite toppings and cheese! 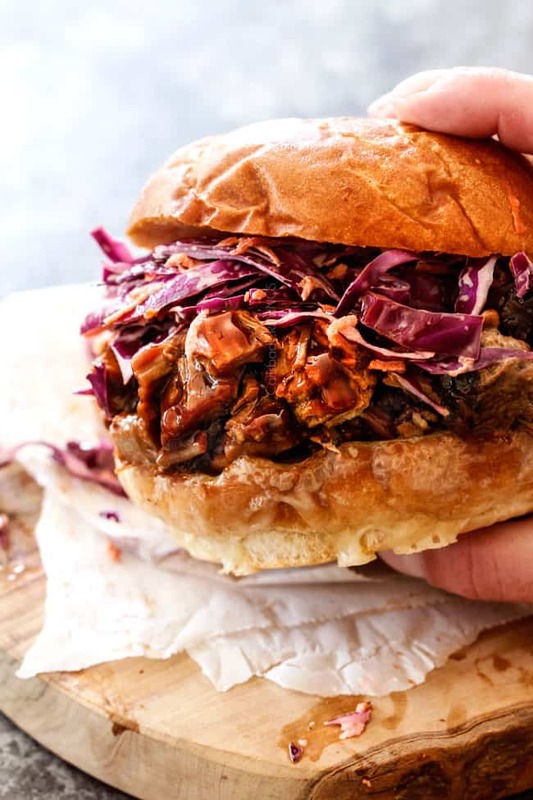 This Leftover Brisket Sandwich recipe was born because serving hearty, rich barbecue brisket on a toasted, cheesy bun topped with fresh, tangy coleslaw is our favorite way to devour brisket. The sandwiches are finger-lickin’ good – literally – and you will love that you can make them in advance. 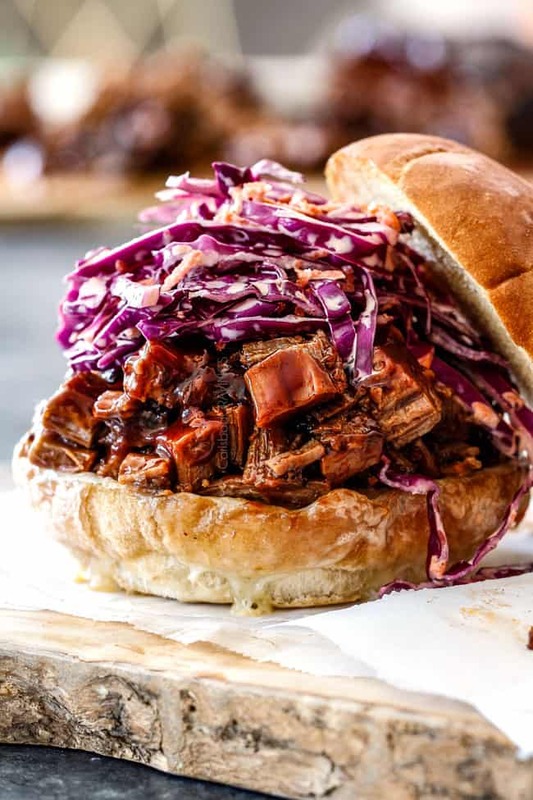 While Brisket Sandwiches may seem complicated, they are actually super simple with most of the cooking time spent in the slow cooker – so you can be off your feet – and so your house won’t be drowning in heat all day – just be swimming in the smell of sensational rich, smoky brisket. The brisket holds its shape so you can either slice the meat it or shred it, which means you don’t have to worry too much about overcooking your beef brisket because it will hold together to the point of being shreddable. When I cooked this beef brisket, it was sooooo tender but I was still able to slice it AND I was still able to easily shred it as well. The brisket can be made entirely in advance for these Brisket Sandwiches so if you have friends over, the only thing you’ll have to do is assemble the sandwiches when they arrive. 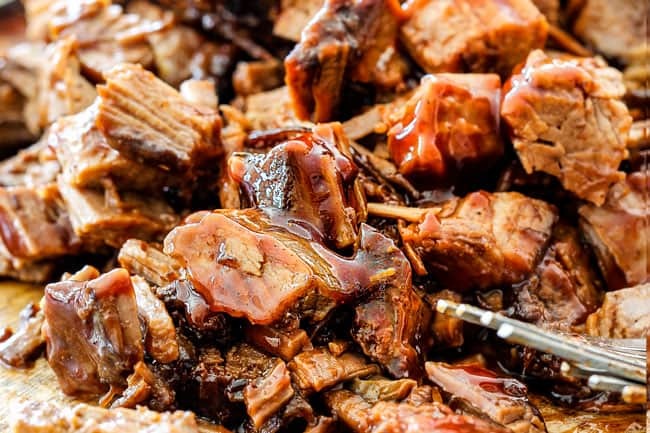 After your beef brisket is cooked, remove the slow cooker ceramic insert and refrigerate it with the brisket and all the juices for 1-3 days – without shredding or slicing it. Not only does the flavor improve, it becomes even more tender and makes prep the next day a snap. When ready to serve, simply skim off the hardened fat then cook on low for 1-2 hours until warmed through then shred/slice. OR Make the beef brisket to completion, including shredding it. If you do this, then I would be sure to reserve some barbecue sauce so you can add some sauce to when you reheat the meat. You can reheat your shredded brisket on LOW in the slow cooker, stove or oven. Brisket Sandwiches can be as dressed up or as dressed down as you would like. You can serve them plain with just a bun and barbecue sauce smothered beef brisket or add cheese or tangy, light coleslaw as I’ve detailed below. 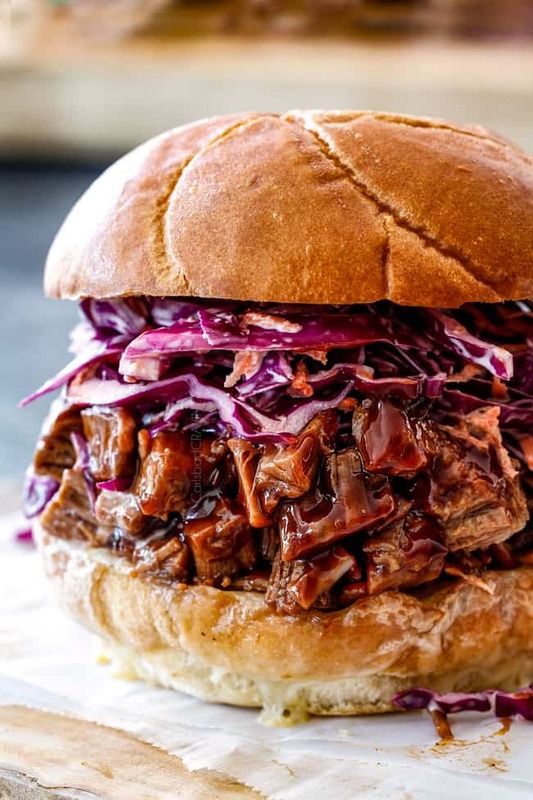 If you’re looking to dress up your Brisket Sandwiches, you can include one or more of the below ideas or create a topping bar so your eaters can customize their own sandwiches to create their very own Best Brisket Sandwich. 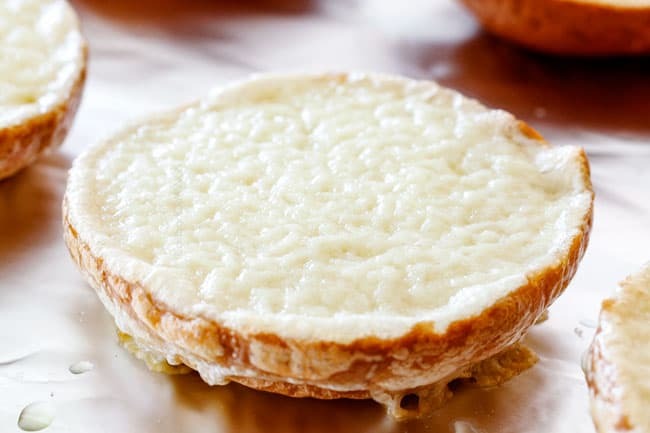 They key to cheese on brisket sandwiches is to not melt the cheese on the buns too far in advance otherwise you end up with cold cheese that looses it’s ooh la la cheesy factor. Rather, you can assemble you’re the buns with the cheese on them but wait to actually melt the cheese until you are ready to assemble the sandwiches. Also, you want a healthy dose of cheese otherwise the cheesiness will just get lost. And you can never go wrong with more cheese! 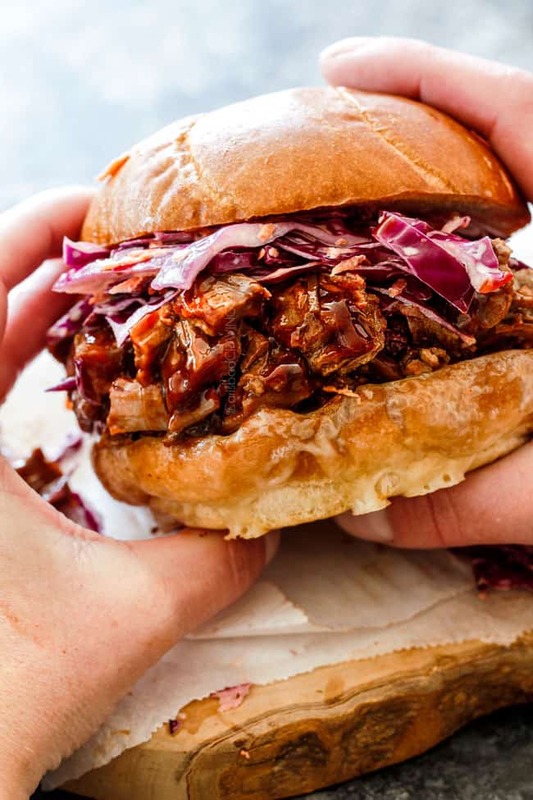 Want to try this Brisket Sandwich Recipe? Pin it to your SLOW COOKER, BARBECUE, MEAT or DINNER Board to SAVE for later! Brisket Sandwiches will be your go-to company meal! 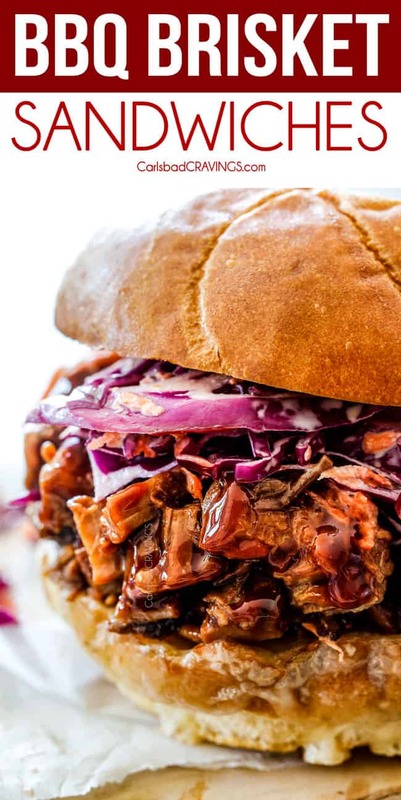 Juicy, flavor exploding, melt in your mouth barbecue brisket piled on cheesy toasted buns with crunchy, light coleslaw are easy to make in the slow cooker, completely customizable, make ahead friendly and the brisket reheats beautifully! Prepare Brisket according to directions. Shred or slice as desired. 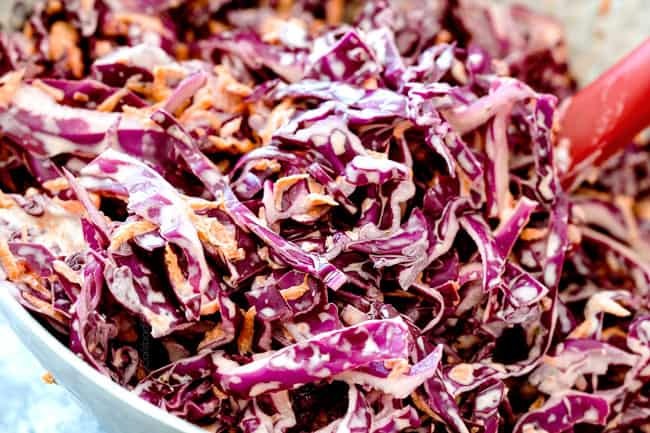 Meanwhile, add Coleslaw ingredients to a large bowl and mix until well combined. Taste and add additional sugar, vinegar, salt to taste. When ready to serve, lay bottom of buns in a single layer on a baking sheet. Top with sliced cheese and broil until melted, approximately, 1-2 minutes. Top cheesy buns with desired amount of brisket followed by coleslaw and any desired toppings. For the cheese, you can assemble you’re the buns with the cheese on them but wait to actually melt the cheese until you are ready to assemble the sandwiches so your cheese doesn't get cold and lost. The barbeque brisket recipe is absolutely amazing! 5 Stars for sure! Made this exactly as the recipe calls for and it came out perfectly. My husband loved it too (and he’s a picky eater).. i will be making this again. No more store bought bbq sauce in this house! Thanks for an amazing recipe. Hi Nicole, I was on a cruise without internet for over a week and I am all sorts of behind but thank you so much for your comment! I’m thrilled this is a “5 star” brisket recipe in your book and that even your picky husband loved it!